The main difference between APC and UPC connectors is the fiber endface. APC connectors feature a fiber endface that is polished at an 8-degree angle, while UPC connectors are polished with no angle. UPC connectors are not exactly flat however; they have a slight curvature for better core alignment. Another more obvious difference is color. UPC adapters are blue while APC adapters are green. What does the difference mean? With UPC connectors, any reflected light is reflected straight back towards the light source. The angled endface of the APC connector causes reflected light to reflect at an angle into the cladding versus straight back toward the source. This causes some differences in return loss, which is a measurement of reflected light that is expressed as a negative dB value (the higher the value, the better). Industry standards recommend that UPC connector return loss should be -50dB or greater, while APC connector return loss should be -60dB or greater. Remember, return loss is different than insertion loss, which refers to the amount of optical power lost through a connector or cable length. Insertion loss is what we use to determine loss budgets. Achieving low insertion loss is typically easier with UPC connectors due to less air gaps than APC connectors. However, manufacturing techniques have improved significantly to create more precise angles on APC connectors and bring insertion loss down closer to that of UPC connectors. There are some applications that are more sensitive to return loss than others that call for APC connectors. For example, in higher optical wavelength ranges (above 1500 nanometers) like those use for RF video signals, reflected light can adversely impact the signal. That is why we see APC connectors being used by most cable companies and other FTTX providers in outside plant applications. APC connectors are also commonly used in passive optical applications (both GPONs and passive optical LANs) due to the fact that many of these systems also use RF signals to deliver video. 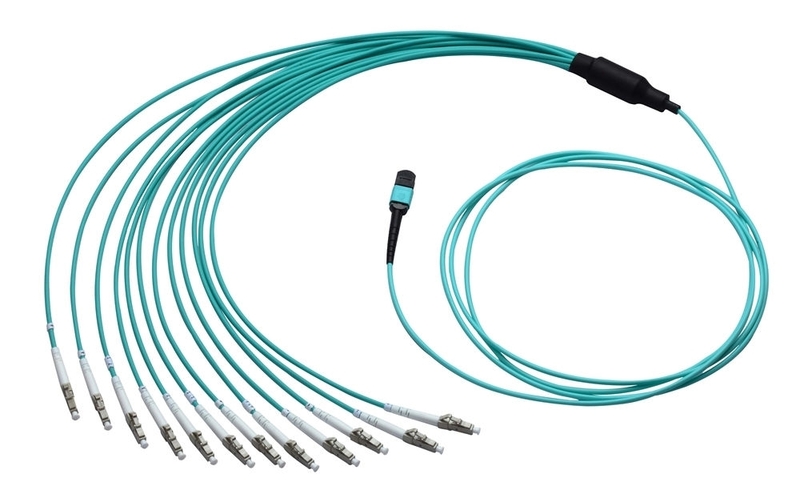 Future higher-speed passive optical networks and other WDM applications that will use higher wavelengths via singlemode fiber will also likely require the reduced return loss of APC connectors. One thing that should be noted is that APC and UPC connectors cannot and should not be mated. Not only does it cause poor performance since the fiber cores will not touch, but it can also destroy both connectors. The last thing you want to do is cause permanent transmitter damage—especially with higher-cost singlemode equipment. As the bandwidth demands grow rapidly, data centers have to achieve ultra-high density in cabling to accommodate all connections. MPO/MTP technology with multi-fiber connectors offers ideal conditions for high-performance data networks in data centers. This article will introduce information about MPO/MTP solutions, such as MPO/MTP trunk cable, MPO/MTP harness cable and MPO/MTP cassettes. Saving installation time–With the special plug and play design, MTP/MPO trunk cables can be incorporated and immediately plugged in. It greatly helps reduce the installation time. Decreasing cable volume–MTP/MPO trunk cables have very small diameters, which decrease the cable volume and improve the air-conditioning conditions in data centers. High quality–MTP/MPO trunk cables are factory pre-terminated, tested and packed along with the test reports. These reports serve as long-term documentation and quality control. Saving space–The active equipment and backbone cable is good for saving space. Easy deployment–Factory terminated system saves installation and network reconfiguration time. Reliability–High standard components are used in the manufacturing process to guarantee the product quality. MPO/MTP interface–MPO/MTP components feature superior optical and mechanical properties. Optimized performance–Low insertion losses and power penalties in tight power budget, high-speed network environments. 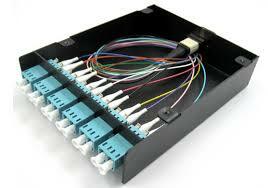 High density–12 or 24 fiber cassettes can be mounted in 1U scaling up to 72 or in 3U scaling up to 336 discrete LC connectors. The above shows that the MPO/MTP system is a good solution for data center requirements. This high density, scalable system is designed to enable thousands of connections. Fiber optic communication is a method of transmitting information from one place to another by sending pulses of light through an optical fiber. The light forms an electromagnetic carrier wave that is modulated to carry information. First developed in the 1970s, fiber-optic communication systems have revolutionized the telecommunications industry and have played a major role in the advent of the Information Age. Because of its advantages over electrical transmission, optical fibers have largely replaced copper wire communications in core networks. Optical fiber is used by many telecommunications companies to transmit telephone signals, Internet communication, and cable television signals. Researchers have reached internet speeds of over 100 petabits per second using fiber-optic communication. Fiber's advantages has led to its use as the backbone of all of today's communications, telecom, Internet, CATV, etc. - even wireless, where towers are connected on fiber and antennas are using fiber up the towers. This photo from the infancy of fiber optics (to the right) was used to illustrate that one tiny optical fiber could carry more communications signals than a giant copper cable. Today one single mode fiber could carry the same amount of communications as 1000 of those old copper cables! Fiber offers thousands of times more bandwidth than copper cables and can go more than 1000 times further before needing repeaters - both of which contribute to the immense economic advantage of fiber optics over copper. You can do a similar analysis for using wireless transmission also, but wireless is limited by the available wireless spectrum which is overcrowded because of everyone's desire to use more mobile devices. Why Convert From Copper Cable To Fiber Optic Cable? If you need some convincing before you make your first fiber optic cable purchase keep the following facts in mind. Fiber optic cable operates much more efficiently and is more secure than traditional copper cabling. Fiber can transmit far more information over greater distance and with a higher clarity while offering a more secure connection. Fiber optic cable is resistant to electromagnetic interference and generates no radiation of its own. This point is important in locations where high levels of security must be maintained. Copper wire radiates energy that can be monitored. In contrast, taps in Fiber optic cable Fiber are easily detected. Copper cable, is also subject to problems with attenuation, capacitance, and crosstalk. Since fiber is made of glass, which is a bad electrical conductor, it does not require grounding and shields itself from other electrical interference. Fiber cables can be run near electrical cables without fear that it will weaken or interrupt the signal. Fiber optic cable does not corrode and is not as sensitive to water or chemicals. This means you can safely run fiber cable in direct contact with dirt or in close proximity to chemicals (with the proper outer jacket materials). Since fiber is not a good conductor of electricity, an installer or user will be safe from electrocution if there is a break in the outer jacket and the fiber is exposed. Fiber (or fibre) consists of a strand of pure glass a little larger than a human hair. Fiber optic cable employs photons and pulsing laser light for the transmission of digital signals. Photons pass through the glass with negligible resistance. As light passes through the cable, its rays bounce off the cladding in different ways as shown below. The optic core of fiber optic cable is pure silicon dioxide. The electronic 1s and 0s of computers are converted to optically coded 1s and 0s. A light-emitting diode on one end of the cable then flashes those signals down the cable. At the other end, a simple photodetector collects the light and converts it back to electrical signals for transmission over copper cable networks. Step index multimode was the first fiber design but is too slow for most uses, due to the dispersion caused by the different path lengths of the various modes. Step index fiber is rare - only POF uses a step index design today. Graded index multimode fiber uses variations in the composition of the glass in the core to compensate for the different path lengths of the modes. It offers hundreds of times more bandwidth than step index fiber - up to about 2 gigahertz. Singlemode fiber shrinks the core down so small that the light can only travel in one ray. This increases the bandwidth to almost infinity - but it's practically limited to about 100,000 gigahertz - that's still a lot! Optical fiber consists of a core and a cladding layer, selected for total internal reflection due to the difference in the refractive index between the two. In practical fibers, the cladding is usually coated with a layer of acrylate polymer or polyimide. This coating protects the fiber from damage but does not contribute to its optical waveguide properties. Individual coated fibers (or fibers formed into ribbons or bundles) then have a tough resin buffer layer and/or core tube(s) extruded around them to form the cable core. Several layers of protective sheathing, depending on the application, are added to form the cable. Rigid fiber assemblies sometimes put light-absorbing ("dark") glass between the fibers, to prevent light that leaks out of one fiber from entering another. This reduces cross-talk between the fibers, or reduces flare in fiber bundle imaging applications. Cable specifications list the core and cladding diameters as fractional numbers. For example, the minimum recommended cable type for FDDI (Fiber Distributed Data Interface) is 62.5/125 micron multimode fiber optic cable.That means the core is 62.5 microns and the core with surrounding cladding is a total of 125 microns. For outdoor applications or use in more strenuous environments, a much more robust cable construction is required. In loose-tube construction the fiber is laid helically into semi-rigid tubes, allowing the cable to stretch without stretching the fiber itself. This protects the fiber from tension during laying and due to temperature changes. Loose-tube fiber may be "dry block" or gel-filled. Dry block offers less protection to the fibers than gel-filled, but costs considerably less. Instead of a loose tube, the fiber may be embedded in a heavy polymer jacket, commonly called "tight buffer" construction. Tight buffer cables are offered for a variety of applications, but the two most common are "Breakout" and "Distribution". Breakout Cables normally contain a ripcord, two non-conductive dielectric strengthening members (normally a glass rod epoxy), an aramid yarn, and 3 mm buffer tubing with an additional layer of Kevlar surrounding each fiber. The ripcord is a parallel cord of strong yarn that is situated under the jacket(s) of the cable for jacket removal. Distribution Cables have an overall Kevlar wrapping, a ripcord, and a 900 micrometer buffer coating surrounding each fiber. These fiber units are commonly bundled with additional steel strength members, again with a helical twist to allow for stretching. To satisfy optical, mechanical and environmental performances and specifications, fiber optic cable was born. The fiber optic cable uses one or more fibers that placed in the sheath as the transmission medium. 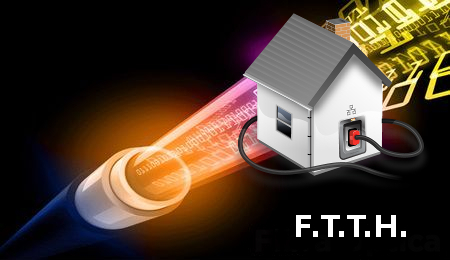 Accompanied by the continuous advancement of network technology, fiber optic cable constantly participates in the construction of telecommunications networks, the construction of the national information highway, Fiber To The Home (FTTH) and other occasions for large-scale use. Although fiber optic cable is still more expensive than other types of cable, it's favored for today's high-speed data communications because it eliminates the problems of twisted-pair cable and so fiber optic cable is still a good choice for people. But how to really get a good performance, state-of-the-art products, we need to understand some basics to identify the types of fiber optic cables. Structure: Core: This central section, made of silica, is the light transmitting region of the fiber.Cladding: It is the first layer around the core. It is also made of silica, but not with the same composition as the core. This creates an optical wave guide which confines the light in the core by total reflection at the core-cladding interface.Coating: It is the first non-optical layer around the cladding. The coating typically consists of one or more layers of a polymer that protect the silica structure against physical or environmental damage.Strengthening Fibers: These components help protect the core against crushing forces and excessive tension during installation. The materials can range from Kevlar to wire strands to gel-filled sleeves.Cable Jacket: This is the outer layer of any cable. Most fiber optic cables have an orange jacket, although some may be black or yellow. The jacket material is application specific. The cable jacket material determines the mechanical robustness, aging due to UV radiation, oil resistance, etc. Jacket Material: PolyEthylene (PE): PE (black color) is the standard jacket material for outdoor fiber optic cables. PE has excellent moisture- and weather-resistance properties. It has very stable dielectric properties over a wide temperature range. It is also abrasion-resistant.PolyVinyl Chloride (PVC): PVC is the most common material for indoor cables, however it can also be used for outdoor cables. It is flexible and fire-retardant. PVC is more expensive than PE.PolyVinyl DiFluoride (PVDF): PVDF is used for plenum cables because it has better fire-retardant properties than PE and produces little smoke.Low Smoke Zero Halogen (LSZH) Plastics: LSZH plastics are used for a special kind of cable called LSZH cables. They produce little smoke and no toxic halogen compounds. But they are the most expensive jacket material. The size of the optical fiber is commonly referred to by the outer diameter of its core, cladding and coating. Example: 50/125/250 indicates a fiber with a core of 50 microns, cladding of 125 microns, and a coating of 250 microns. The coating is always removed when joining or connecting fibers. A micron (µm) is equal to one-millionth of a meter. 25 microns are equal to 0.0025 cm. (A sheet of paper is approximately 25 microns thick). Besides the basics, Fiber optic cables can be classified by other ways. 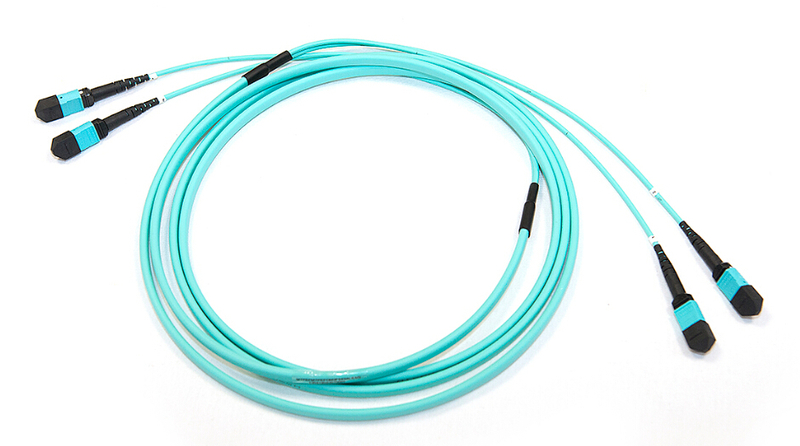 Multi-Mode Fiber (MMF) Cable: Center glass core is coarse (50 or 62.5 µm). It can transmit a variety of patterns of light. However, because its dispersion is large, which limits the frequency of the transmitted digital signal, and with increasing distance, the situation will be more serious. For example, 600Mb/km of 2km fibers provide the bandwidth of only 300 Mbps. Therefore, MMF cable's transmission distance is relatively short, generally only a few kilometers. General MMF patch cables are in orange, also some are gray, joints and protection are beige or black. Single-Mode Fiber SMF Cable: Center glass core is relatively fine (core diameter is generally 9 or 10 µm), only one mode of light transmission. Therefore, the dispersion is very small, suitable for remote communication, but it plays a major role in the chromatic dispersion, so that SMF cable has a higher stability requirement to the spectral width of the light source, just as narrower spectrum width, better stability. General SMF patch cables are in yellow, with joints and cases in blue. Simplex Cable: Single strand of fiber surrounded by a 900µm buffer then a layer of Kevlar and finally the outer jacket. Available in 2 mm or 3 mm and plenum or riser jacket. Plenum is stronger and made to share in fire versus riser is made to melt in fire. Riser cable is more flexible. Duplex Cable: Two single strands of fiber optic cable attached at the center. Surrounded by a 900µm buffer then a layer of Kevlar and finally the outer jacket. In data communications, the simultaneous operation of a circuit in both directions is known as full duplex; if only one transmitter can send at a time, the system is called half duplex. Central Tube Cable: Fiber, optical fiber bundles or fiber optic cable with no stranding directly into the center position. Stranded Tube Cable: A few dozens or more root fiber or fiber tape unit helically stranded around the central strength member (S twist or SZ twisted) into one or more layers of fiber optic cable. Skeleton After Tube Cable: Fiber or fiber after spiral twisted placed into the plastic skeleton cable slot. Aerial Cable: Aerial cables are for outside installation on poles. They can be lashed to a messenger or another cable (common in CATV) or have metal or aramid strength members to make them self supporting. The cable shown has a steel messenger for support. It must be grounded properly. A widely used aerial cable is optical power ground wire which is a high voltage distribution cable with fiber in the center. The fiber is not affected by the electrical fields and the utility installing it gets fibers for grid management and communications. This cable is usually installed on the top of high voltage towers but brought to ground level for splicing or termination. Armored Cable: Armored cable is used in direct-buried outside plant applications where a rugged cable is needed and/or rodent resistance. Armored cable withstands crush loads well, needed for direct burial applications. Cable installed by direct burial in areas where rodents are a problem usually have metal armoring between two jackets to prevent rodent penetration. Another application for armored cable is in data centers, where cables are installed underfloor and one worries about the fiber cable being crushed. Armored cable is conductive, so it must be grounded properly. Breakout Cable: Breakout cable is a favorite where rugged cables are desirable or direct termination without junction boxes, patch panels or other hardware is needed. It is made of several simplex cables bundled together inside a common jacket. It has a strong, rugged design, but is larger and more expensive than the distribution cables. It is suitable for conduit runs, riser and plenum applications. It's perfect for industrial applications where ruggedness is needed. Because each fiber is individually reinforced, this design allows for quick termination to connectors and does not require patch panels or boxes. Breakout cable can be more economic where fiber count is not too large and distances are not too long, because it requires so much less labor to terminate. Submarine Cable: Submarine cable is the cable wrapped with insulating materials, laying at the bottom of the sea, to set up a telecom transmission between countries. Tight Buffered Cable: Multiple color coded 900µm tight buffered fibers can be packed tightly together in a compact cable structure, an approach widely used indoors, these cables are called tight buffered cables. Tight buffered cables are used to connect outside plant cables to terminal equipment, and also for linking various devices in a premises network. Multi-fiber tight buffered cables often are used for intra-building, risers, general building and plenum applications. Tight buffered cables are mostly built for indoor applications, although some tight buffered cables have been built for outdoor applications too. Loose Tube Cable: On the other hand multiple (up to 12) 250µm coated fibers (bare fibers) can be put inside a color coded, flexible plastic tube, which usually is filled with a gel compound that prevents moisture from seeping through the hollow tube. Buffer tubes are stranded around a dielectric or steel central member. Aramid yarn are used as primary strength member. Then an outer polyethylene jacket is extruded over the core. These cables are called loose tube cables. Loose tube structure isolates the fibers from the cable structure. This is a big advantage in handling thermal and other stresses encountered outdoors, which is why most loose tube fiber optic cables are built for outdoor applications. Loose-tube cables typically are used for outside-plant installation in aerial, duct and direct-buried applications. Indoor Cable: Such as distribution cables. Distribution cable is the most popular indoor cable, as it is small in size and light in weight. They contain several tight-buffered fibers bundled under the same jacket with Kevlar strength members and sometimes fiberglass rod reinforcement to stiffen the cable and prevent kinking. These cables are small in size, and used for short, dry conduit runs, riser and plenum applications. The fibers are double buffered and can be directly terminated, but because their fibers are not individually reinforced, these cables need to be broken out with a "breakout box" or terminated inside a patch panel or junction box to protect individual fibers. Outdoor Cable: Outdoor fiber cable delivers outstanding audio, video, telephony and data signal performance for educational, corporate and government campus applications. With a low bending radius and lightweight feature, this cable is suitable for both indoor and outdoor installations. These are available in a variety of configurations and jacket types to cover riser and plenum requirements for indoor cables and the ability to be run in duct, direct buried, or aerial/lashed in the outside plant.